Until about the middle of the nineteenth century small farmers and fishers in Nova Scotia struggled to make a living from the soil while some built small mills to take advantage of the water power provided by our many rivers and lakes. Small, local manufacturers and home-made goods supplied most needs along with imports, mostly from the fast growing industries of New England. Nova Scotia’s merchants sold fish to the West Indies, bringing back rum and molasses to New England where they bought manufactured goods. It was a pattern of trade that worked well for generations. Few really large fortunes were made, but there was a solid, mercantile elite with considerable political and economic power. Chief among the Halifax merchants in the first half of the nineteenth century, was Samuel Cunard, the founder of the Cunard shipping line. His shipping line thrived because he invested in the advancing technology of steam navigation and organized his line along industrial principles. His ships ran on time, empty or full, making his service reliable and predictable. He started out with a contract to bring the Royal Mails to Halifax beginning service in 1840. As it became more successful the company left Nova Scotia for Britain. Important industrial technology was brought to Nova Scotia by the General Mining Association. The British company commenced coal mining operations in Pictou County in 1827 and brought over Nova Scotia’s first locomotives in 1839. (See Samson) The company was not very profitable during the 45 years it operated here, but it continued to invest in the latest coal mining technology, bringing it to the Nova Scotia coal fields it controlled. It brought workers, the company town, company housing, the apparatus of nineteenth century industrial society. From the shops of the General Mining Association knowledge of steam engines and metal fabrication spread. Nova Scotia has a wide range of mineral resources including coal and iron and northern Nova Scotia was the birthplace of the Canadian steel industry. 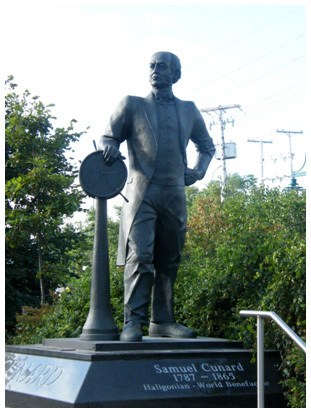 In 1850 the first batch of steel was made at Londonderry, Colchester County and the first sustained production of steel began at Trenton, Pictou County in 1883 at Nova Scotia Steel. In order to promote Canadian manufacturing, the Macdonald government introduced a program in 1879 known as the National Policy. Tariffs were raised on imported manufactured goods and duties were lowered on imports of raw materials and manufacturing equipment. This opportunity was seized by Nova Scotia businessmen and in the 1880s there was a frenzy of factory building. The old West Indies trade was given a boost by the expansion of sugar refining and three cotton mills were built along with many other new factories and the expansion of existing ones. For all the optimism there were significant weaknesses. Nova Scotia had a small, scattered population, Halifax (the capital and largest city in the region) had solid chartered banks but was slow to develop the financial infrastructure to raise capital for large factories. The mineral resources, although amazingly varied, are limited and expensive to mine. The abundant coal of northern Nova Scotia is high in sulfur and methane. Historians have debated the cause of Nova Scotia’s arrested industrial development. The industries that started with such promise withered and became less profitable after 1900. Mergers and consolidations within industries took control of many operations out of the region. The conservative investing habits of the local elites is also cited, along with out migration, high rail freight rates and even the deliberate underdevelopment of the region by Ottawa. It is a complex question and the answers are equally complex and open to debate. “The National Policy and the Industrialization of the Maritimes, 1880-1910"
“Maritime Industrialization from 1870-1910: A Review of the Evidence and Interpretation”.